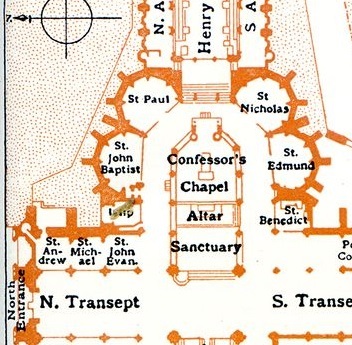 Despite being spared the destruction wrought upon other religious sites during the dissolution of the monasteries in the reign of Henry VIII, there appear to be quite a few ‘lost’ burial locations in Westminster Abbey. Tombs and bones often get disturbed or lost during reconstruction or rebuilding work. For example, there was a major find in 2015 of medieval bones believed to date from the 11th and 12th centuries, placed there during the rebuilding of the abbey in the reign of Henry III. However, the lost burials of Edward I and Eleanor of Castile's young children post date this – they were, in fact, the grandchildren of Henry III. One infant, Beatrice, was said to be buried at the feet of Henry III. Alphonso, who was heir to the throne for most of his life until he died a few months short of his eleventh birthday, was buried in the nave, but the location is now unknown. His older brothers, John and Henry, were also buried in the abbey but, again, I believe these burial sites are lost. I've not been able to find information on any major construction work that might have destroyed these burial sites, nor evidence that they were moved. Is it known what happened to them? Most of them aren't really lost, but the precise location is disputed, notably for those resting in Westminster Abbey. The traditional account is that four of Edward I's children were buried together in the Cosmatesque "tomb", together with their aunt Katherine. This chest, or tomb, or perhaps an altar, now sits in the recess between St. Edmund and St. Benedict's Chapels. Left: The presumed tomb of Henry, John, Alphonso and Eleanor. Right: Layout of the Abby where the chest is located. This tradition can be traced to the 1611 writings of John Speed, who was probably transcribing from an anonymous 1595 manuscript. He asserts that John is buried "by the wall between St Edmund's and St Benet's chapels [and] there is remaining over him a tomb of marble, inlaid, with his picture in an arch over it", and that Henry, Alphonso and Eleanor were buried in the same place with their imagery also on the arch. This arch is now plain, though records indicate it depicted four kneeling figures. But Speed's account is almost certainly at least partially wrong, because Eleanor was buried at Beaulieu Abbey. It's possible she was mixed up with Katherine, or Joan, or perhaps Berengaria. It is known that the elder Katherine once had her own magnificent tomb, of which no trace currently remain, as did Henry and John. The latter used to be buried to the north of the Confessor's shrine, and Alphonso was said to be buried next to the Shrine of the Confessor, among his other siblings. The original resting places of the younger Katherine and Joan were, however, not recorded. The reason for the uncertainty and confusion is that this is assuredly not where they were originally buried. All agree that the Cosmati tomb-altar-chest is not even in its original position. 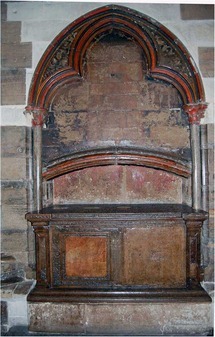 It was probably originally in the Confessor's Chapel, which was running out of room by the late 14th century. To cope with the lack of space for new tombs, many old ones were removed, in a haphazard process that largely went unrecorded. The result is a hazy picture of where the royal children ended up, due to fragmentary and contradictory records. The other problem is that the list of Edward I's children is disputed. Six survived their childhood and four sons died young, but the number of daughters is uncertain. Most of them were not buried within Westminster: A second Joan was buried in Clare, Margaret the Duchess of Brabant at the Cathedral of St. Michael and St. Gudula in Brussels, Mary of Woodstock in Amesbury Abbey, Elizabeth of Rhuddlan in Waltham Abbey, as well as Edward II in Gloucester Cathedral. Howell, Margaret. "The children of Henry III and Eleanor of Provence." Thirteenth Century England IV (eds PR Coss and SD Lloyd) (1992): 57-72. Badham, Sally. “Edward The Confessor's Chapel, Westminster Abbey: The Origins of the Royal Mausoleum and Its Cosmatesque Pavement.” The Antiquaries Journal, vol. 87, 2007, pp. 197–219. Badham, Sally. "Whose Body? Monuments Displaced from St Edward the Confessor's Chapel, Westminster Abbey." Journal of the British Archaeological Association 160.1 (2007): 129-146. Badham, Sally, and Sophie Oosterwijk. “The Tomb Monument of Katherine, Daughter of Henry III and Eleanor of Provence (1253–7).” The Antiquaries Journal, vol. 92, 2012, pp. 169–196. Not the answer you're looking for? Browse other questions tagged middle-ages england plantagenets or ask your own question. Were children often renamed in late Saxon England? How much knowledge of the past was destroyed during the Dissolution of the Monasteries? Why is Richard I (The Lion-heart) considered to be a good king and Jean I a bad one? Did Edward the Confessor choose Harold Godwinson as his successor? Did Richard II of England willingly abdicate the throne to Henry of Bolingbroke?